Cramming more than one or two fingers at a time onto the fretboard is usually just too hard for most students for the first few months. What if there were some cool sounding chords that are actually easier to play than the most commonly taught “beginner” chords? Many beginning guitar students show up to their first lesson with a well-intentioned instructor and are immediately handed a sheet of chord diagrams featuring the CAGED chords as well as Amin, Dmin, and Emin. The teacher may also throw in F for good measure. They may even try to show the student a root position E shape barre chord. The problem with this approach is that, while these are essential chord forms for rock and pop guitar as well as being very useful for understanding the layout of the fingerboard, they are often much too physically taxing for soft un-calloused fingertips and weak hands. If you are open to the idea of playing some chords that exploit open strings and jump around the neck a little bit, we can explore some colourful options that will get you playing without too much (if any) finger pain or discomfort. (It’s extremely important that you get your guitar setup by a professional to lower the action and make it as playable as possible. Most students usually have a guitar that came straight from the store. Many are fine guitars but need that extra bit of care to make them playable. Don’t cheap out on this!). The following is a series of chords that actually sound pretty good together and make use of only one or two fingers at a time. Several also have enough space between fingers that you won’t feel at all jammed up. Care does need to be taken to sound only the strings indicated. Don’t just start strumming all six strings and expect the magic to happen. From this group of chords, first, try them in the order presented. See if you can get the sequence flowing smoothly from chord to chord from the beginning of the list to the end then start the sequence again. Once that starts to get easier, perhaps start experimenting with smaller sub-sets and pairs. For instance, playing Amaj9 to Dmaj9 then Amin9 to Dmin9 has a nice modal shift. Notice that this chord sequence starts on Amajor9. It then cycles up in fourths symmetrically until it gets to Cmajor7 at which point there are 4 chords diatonic (of the key) to C major. The D 6-9/F# breaks out of the key momentarily and then returns to the key of C with Fmaj13. (A really colourful IV chord.) These first chords all stay well within the lower half of the guitar fingerboard. It’s important not to get so fixated on learning the chords in the first position that the rest of the guitar gets neglected and you develop an irrational fear of the higher positions! Bonus! Here is a simple I-vi-ii-V in Cmajor. It uses only 1 and 2 finger chords. This sequence is a very common chord progression in many styles of music. These specific colours in this particular example are fairly “jazzy” but if you were to use simple first position versions of these chords without fancy 7ths, etc (remember those difficult but simple chords your guitar teacher keeps trying to show you?) like C -Amin – Dmin – G it will give this a more pop or folky character. (How you play the chords will also dictate the style, of course.) These chords stay in the comfort of the first or “open” position. Double Bonus! This sequence outlines a ii-V7-I-VI7 progression in C major using only 1 and 2 finger chords. This is a common jazz chord progression that takes on a slightly impressionistic quality through the use of open strings and seconds. This sequence leaps up to the area around the 10th fret for the first pass of the progression then drops back down to the lower part of the neck for the second pass. Hopefully, this shows the beauty of learning more than one way to play a particular chord and exploring the fingerboard. Triple bonus! Here is a I-vi-ii-V7 progression in D major using only 2 finger chords. This is functionally the same progression as the first bonus progression but in the key of D major instead of C major. 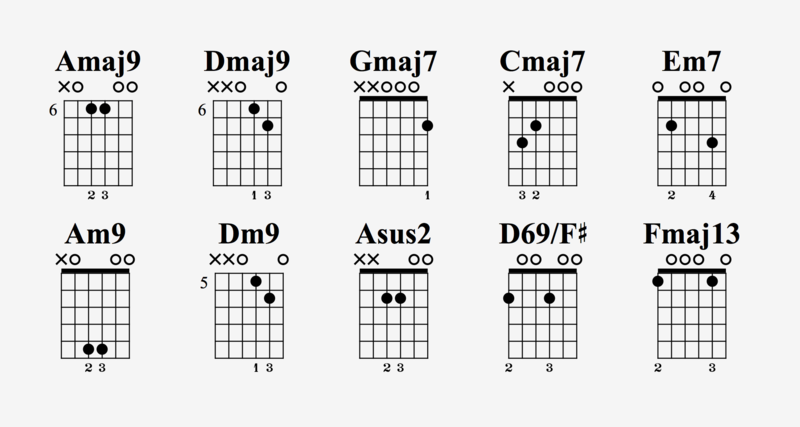 Play all of these sequences strummed with a pick or your thumb at first to hear the sounds and keep it simple. You can then try breaking up the chords with the plectrum or even fingers if fingerpicking is something you might want to explore. 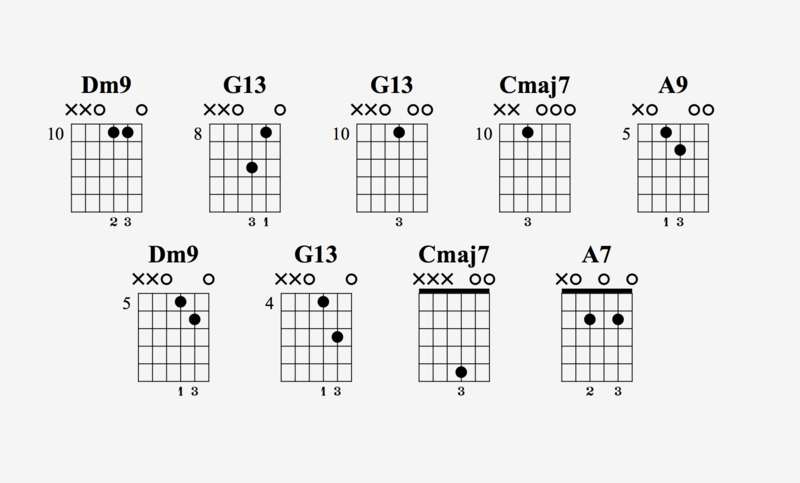 Follow the chord diagrams and make sure to omit any notes that have an X next to them. (Really important!) This is by no means an exhaustive or even remotely complete chord reference. It is just a selection of chords that are particularly nice sounding on their own or even mixed and matched. Try them on for size and see which ones sound good to you. Marc-Andre Seguin is the webmaster, “brains behind” and teacher on JazzGuitarLessons.net, online resource for learning how to play jazz guitar. He draws from his experience both as a professional jazz guitarist and professional jazz teacher to help thousands of people from all around the world learn the craft of jazz guitar. Thanks 🙂 Just one question, why is the A-string in the Asus2 chord in the first chart crossed out? It should work with the chord. Yes you can play the Open A string for this chord. Got small hands, this chords will really help me a lot. You are welcome. Thank you very much Liz!